1. pertaining to a spine. 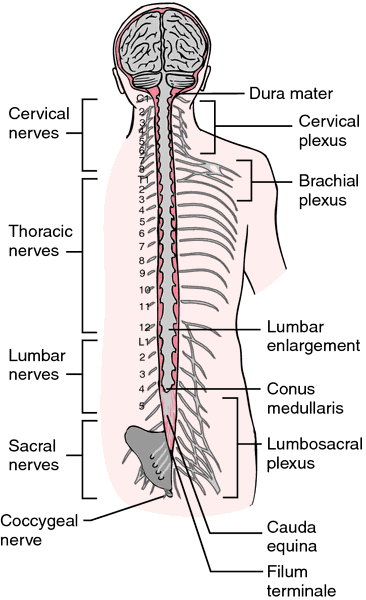 2. pertaining to the vertebral column. 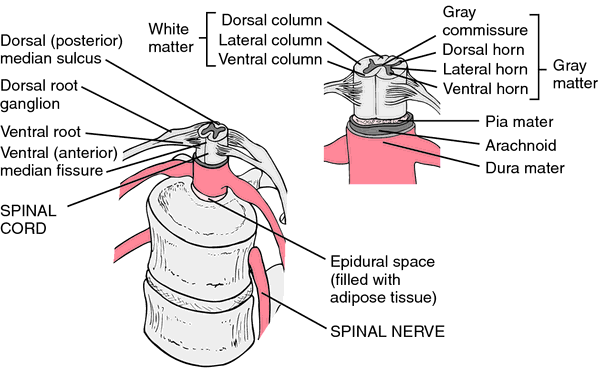 Gross anatomy of the spinal cord. From Applegate, 2000. Cross section of the spinal cord. From Applegate, 2000. Each row has a single, central, large rachidian tooth flanked by five lateral teeth, the most distal of which is large and has a sharp point, followed by numerous thin, filamentous marginal teeth along the outer edge (Fig. Three pairs of lateral teeth flank the central rachidian tooth. anulatus is characterized by having a brown or white body with pink, white, and brown spots, smooth papillae epithelium at the base and papillated in the distal part of each papilla, unbranched digestive gland ducts within the dorsal papilla, smooth jaws, and smooth rachidian and lateral teeth. Rachidian with five distinct cusps, a minute additional pair sometimes discernable; central cusp largest and rounded, the outer pair small and curving inward. The expanded lateral flanges on the rachidian shaft (the 'hood') and the interlocking of lateral tooth bases are clearly evident in the taxa examined here (Fig. Rachidian with broad, trigonal cusp and well-developed hood, but lacking a distinct transverse basal ridge and near-basal medial indentation; cutting edge with a very long, acuminate, central denticle and 2 or 3 smaller, likewise elongate denticles on each side. Radula with rachidian and two pairs of laterals with straight shafts, cusps usually broad. 53D-F): Formula [infinity]+3+1+3+[infinity], with ca 60 transverse rows of teeth; lateral flanges of rachidian well developed creating a distinct hood, cusp with a strong transverse basal ridge, the apex broadly trigonal with stout denticles, a larger, lanceolate median one and 2 or 3 smaller ones on each side. The length and width of rachidian teeth, lengths of the lateral teeth, gap between the rachidian teeth of adjacent transverse rows (Fig. 5 rows/mm in adult; formula 1+(5-9)+(10-30); rachidian small and sharply pointed, cusp and base-plate more or less of equal length; lateral teeth progressively increasing in size from first to last, innermost slender and more or less straight, outermost one very large, more than twice as long as innermost one, and with a quadrate, laterally indented base-plate and strong, curved, acutely pointed cusp; marginal teeth all vestigial, no teeth of intermediate size and boundary between lateral and marginal series thus abrupt. 5 rows per/mm in adult; formula varies considerably with species (Table 2); rachidian present, but small; inner lateral teeth slender and acuminate, increasing slightly in size; outer 2 or 3 laterals considerably larger, each with a stout quadrate base-plate and curved, sharply pointed cusp; marginal teeth either rapidly or gradually decreasing in size and becoming vestigial at radula margin, but always with 1 or 2 of intermediate size adjacent to outermost lateral tooth, more in A.
Radula possessing rachidian tooth; no clear distinction between lateral and marginal series and no one tooth noticeably larger than the others.